Practically every research institute in the Netherlands works with engineered (man-made) nanomaterials these days. These nanomaterials may have quite different hazard characteristics from the same chemical compound at a micro-scale level. Whenever new nanomaterials are developed, researchers are the first to be exposed to their possible dangerous characteristics. Therefore particular care must be taken when working with them. 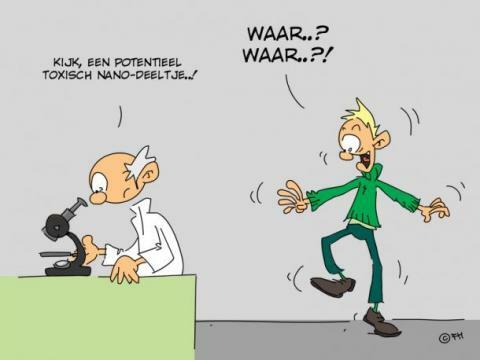 NWO-I therefore has taken the initiative, together with Delft University of Technology, Leiden University and TNO, to develop a set of guidelines on the safe use of nanomaterials in Dutch academic research settings. This project resulted in two reports: a sector analysis report, including a guide to risk governance (sub-report A) and a good practices report (sub-report B). Sub-report A offers more insight in the number of researchers that are potentially exposed and the chemical and physical properties of the materials that are used. The report also estimates the amounts used, number of employees exposed, frequency and duration of exposure. This information is needed to estimate the probability and severity of the exposure and thus the possible health risks for researchers. Sub-report B contains seventeen good practices, which are drawn up after studying the (international) literature on safe use of engineered nanomaterials in occupational settings, with a focus on a research environment. The topics discussed are: risk evaluation and risk assessment of engineered nanomaterials, research planning, cleaning procedures in nanolaboratories, training and the use of Standard Operating Procedures. You can download sub-report B Good Practices at the top right hand corner of this page.